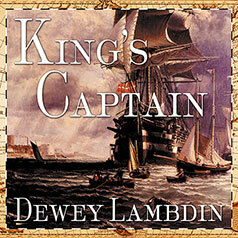 Following in the footsteps of Horatio Hornblower and Jack Aubrey, whose ripping adventures capture thousands of new fans each year, comes the heir apparent to the mantle of Forester and O'Brian: Dewey Lambdin and his acclaimed Alan Lewrie series. In King's Captain, Alan Lewrie is promoted for his quick action in the Battle of Cape St. Vincent. But before he's even had a chance to settle into his new role, a mutiny rages through the fleet, and the sudden reappearance of an old enemy has Lewrie fighting not just for his command but for his life.